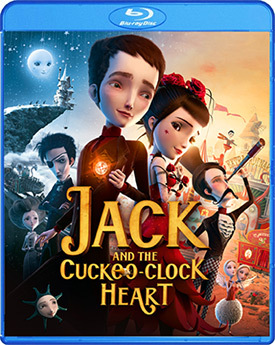 The freaky-cute look of Jack and the Cuckoo-Clock Heart can be described as a cross pollination of malnourished Russian nesting dolls with Tim Burton's obsession for Helena Bonham Carter and Johnny Depp. 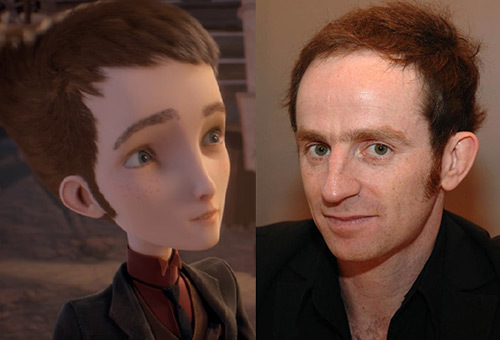 A fresh break from the Disney- Pixar-Etcetera tradition, the French/ Belgian animated lead characters feature bulging heads, bulbous human eyes, cherry-cheeked anglo skin and petite French nostrils and lips. At its onset, the sights and sounds of the movie seize you with grand expectations: that this movie will transport you to computer-generated nirvana. But as the story unfolds, the viewer awakens to the baffling question of who is the audience? A pregnant mother-to-be trudges through snow, frostbitten in her nighty and cape, to deliver and abandon Jack, her semi-stillborn son. The mom's magical midwife, Madeleine, resuscitates the newborn's frozen heart by installing a cuckoo clock ticker. Wind up Jack, and he comes tick-tick-tocking back to life. The fragile lad grows up uneventfully in Madeleine's whimsical household amid characters like Arthur, the decrepit old man whose withering spine has been fortified by a functioning xylophone. He plays lyrical music from over his shoulders. Jack, as we expected, inevitably strays from his sequestered life and falls in love with the equally-overly-adorable songstress, Miss Acacia from Andalucia, who is, quite literally, the love of his life. 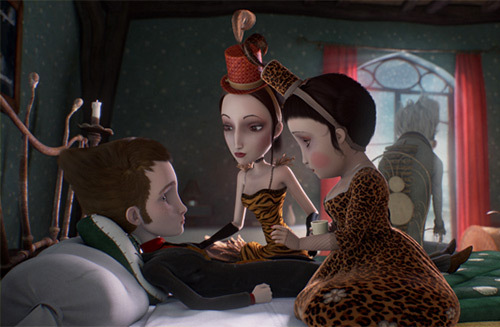 The schizophrenia of Jack's courtship includes encounters with Jack the Ripper, George Méliès (the renown French "cinemagician") and a circus carnival of horrors, all inspired by Victorian Europe. While the music sometimes intrudes in the story telling with its abrupt rhythmic cacophony, the interruption is not only refreshing, but often liberates the film from floundering in schmaltzy melodrama. The poetry that was written for the lyrics (and occasionally for recitation) is not consistently sensible or logical, but then poetry rarely is. When the script meanders from even fairy tale reality, there are still the visuals to engage the viewer. Always quirky, the animation styles vary from location to location, from Scotland to France to Spain. There is lots of creative music, poetry and artistry to enjoy in the film. Alas, this project is not the Eden of Animation, but certainly there is enough talent provided by Frenchman Mathias Malzieu to eagerly anticipate his next project. 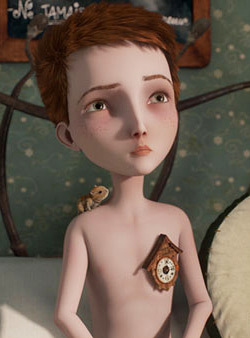 Malzieu wrote the original book, (La Mécanique du Cœur), co-wrote the script, provided the voice for Jack, wrote the lyrics for his band Dyonisos, sang his own songs, and then co-directed the film. He is a one-man-Hollywood. The venerable versatile French Director Luc Besson embraced the film and author Malzieu; and his wife Virginie Besson-Silla produced. Having watched both the English and the French versions, I recommend eschewing the dubbed edition, (while I still admire Jack's creatives and producers for their effort to cast and translate the original French film). Malzieu, musicians, select members of the cast, and producer Virginie Besson-Silla talk about the film. Veteran French actor Jean Rochefort is joined by fellow eccentric performers to provide insight into the magnetism of the project. No mention is made of the bankruptcy of one animation house and its replacement midway through the project. The event does help explain the mélange of CG styles in the film; however, that very variety adds to the inspirational and artistic appeal for fans and students of computer graphics.